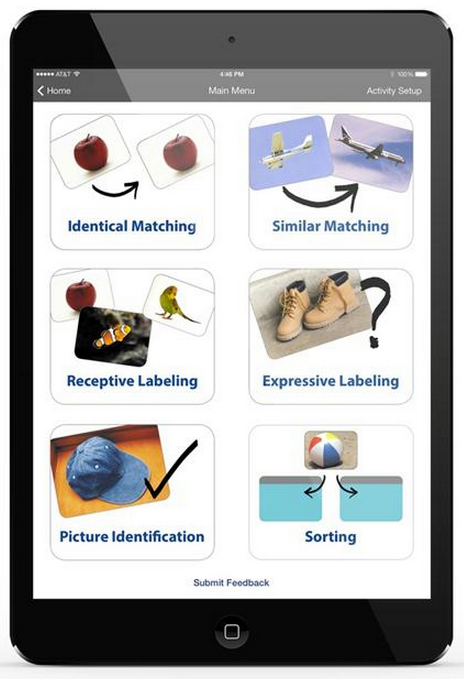 At Stages Learning we have been working earnestly to re-design and improve our Language Builder App to help children with autism develop language skills using proven ABA therapy techniques. If you would like to get a special first-look at our Easy Start Mode and the new features we’ve added, we would love to have you join us as a beta tester. We are asking that you use the App for four hours over a two-week period, tell us what works and what doesn’t, join our Facebook Beta Tester group, answer a couple questions, and write a brief review. In return, you will be reimbursed for the Pro Version of the Language Builder App v.2.0 and receive a gift card for $100.00 that you can use in our online store. If interested or for more information please contact Rebecca@stageslearning.com. Calling all teachers: We want to hear from you! Please help us make the best education products possible. Help us by filling out a brief survey so that we can better understand your needs. Fill out our survey by July 7th to win a $50 Stages Learning gift card. 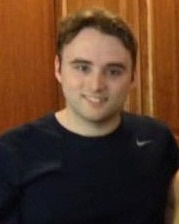 Take the survey here. Stages Learning Bingo Card Generator: It Now Comes in Spanish and French! Our Stages Learning Bingo Generator automatically creates Bingo Cards to use for language skill development and learning other languages too! 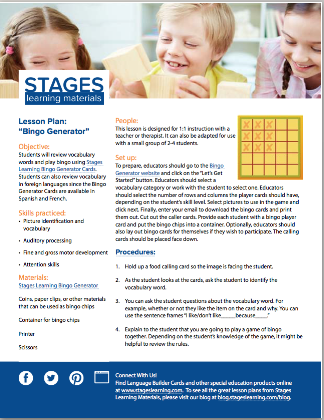 Our new free lesson plan shows you different ways to use the Bingo Generator for teaching children with special needs language and social skills. Our U-Play Mat is a U-shaped mat with 10 clear pockets on the surface that allows a child to sit inside the opening of the “U” while the teacher, parent, or therapist sits on the outside. Designed by a pediatrician, this provides an excellent setting for eye contact and face-to-face interaction. Watch 4 short videos on how to use the U-Play Mat for teaching language skills. Watch the videos here and click here to purchase U-Play Mat. Mid Day News, June 18.